I don’t have a birth certificate. Back then in India, few did. Many people weren’t even born in hospital. I was, so I actually have a scrap of paper on the hospital’s letterhead, stating that “A baby girl was born to Mrs. A.C. Bose,” with a date. That’s all. How then could I prove who I was? It wasn’t really a question; I was whoever I claimed to be. More important was to prove my age: Indian systems for education or recruitment or memberships of all sorts were full of age cut-offs. My Board-issued high school certificate with my name and date of birth was my first actual legal document. (Though I’d traveled overseas, I’d been listed – like most children – on my mother’s passport.) The school insisted our parents verify both name and birthdate, because it wasn’t easily changed once submitted. In the process, we discovered a classmate we’d known as Sweetie for ten years was actually Rajivi; another had misspelled her name throughout her school years, and now corrected it. Some people discovered they’d always celebrated their birthday on the wrong date. Indian names transliterated into English don’t have standard spellings, though people who operate in an English-language system do standardize their names. But I still remember my friend Navin being quite dismayed that somehow his name had been spelled Naveen on his passport. When I registered to vote in Mumbai (then Bombay), my name was transcribed into Hindi or maybe Marathi, and then back again to English. It completed this transformation as Rupas Bhosa (but I was still allowed to vote). Internationally, the high school certificate didn’t count for much, perhaps because it didn’t name my parents. Instead, I got a sworn affidavit from my aunt, saying she was present at my birth and could verify my parentage and date and place of birth. Later, my passport (which by then did list parental names) became my main identity document. When we got our first apartment in Mumbai, friends told us we needed to apply for a ration card. “Why?” I asked. We didn’t need subsidized wheat flour or sugar; we could afford open-market goods, and we wanted to leave the rations to those who really needed it. After the application, they said, an inspector would make a surprise visit to verify the facts – mainly, that we did actually live at the stated address. Problem? With both of us working full time, there’d be no one at home. Fortunately, Mumbai inspectors were resourceful. He talked to our neighbors, who vouched for us. A few weeks later, we had our ration cards and then our gas cylinder. THAT WAS THEN, WHAT’S IT NOW? Most of India’s children then didn’t graduate from high school and get the readily-accepted Certificate. Proof of identity came from other things. Voter records. Ration cards. Affidavits provided by various people, ideally a government official. Permanent Account Numbers (PAN), issued to income-tax payers. Many older people didn’t know their birth dates by the western calendar, though they might know under which star they were born . In such cases, faced with the need to provide information in the organized sector – such as getting passports – they guessed. Now, decades later, the situation in India is only marginally better. Over 40% of births aren’t registered. Most Indians don’t have high school certificates or driver licenses, nor do they hold passports. Not everyone registers to vote – and, as I know from experience, the rolls aren’t necessarily accurate for identification; their job is to ensure that everyone votes only once, not that names aren’t misspelled. Only a small fraction of Indians pay direct taxes and have PAN numbers. Unlike the US with its Driver’s Licenses and Social Security Numbers, or Singapore with its NRIC, India doesn’t have identifiers for its citizens or residents. So now an ambitious project now underway plans to offer every Indian a 12-digit unique identification number. It’s ambitious, it’s fraught, and it’s got teething troubles – but it seems to have come further than anyone expected. The plan is to issue every Indian resident a Unique Identification number, the UID. 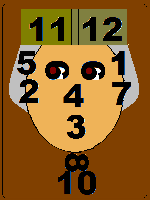 It’s twelve randomly generated digits that deliberately does not contain information about age, caste, or gender. And it’s backed, not by the memories of family members, but by bio-metrics: Ten fingerprints, and two iris scans. The UID project plans to provide each resident of India (whether a citizen or not) with an Identity document. It’s being managed by the Unique Identification Authority of India (UIDAI), within the Planning Commission, and is headed by Nandan Nilekani (formerly of computer company Infosys). It was originated by a group of overseas Indians who returned to give the project its start. It’s being called “Aadhaar” (meaning foundation). Getting a UID requires a proof of identity from other sources (the ubiquitous ration cards, voter enrollments, Permanent Account Numbers for taxes, and driving licenses – a total of 18 acceptable documents are listed on the UIDAI website) and a proof of address (a further 33 documents are acceptable). The idea is that any documentation that a person might have can be rolled into this one number, which will then be forever linked with that person’s name and biometrics. For those without documents, there are “introducers.” These are people who, once they have a UID, can introduce others. Right now, the plan is barreling ahead. According to the UIDAI website, 187.6 million “Aadhaar” documents have been issued, of which 46 million are in Andhra Pradesh, 37m in Maharashtra, and 15m in Karnataka. The hope is that all of India’s 1.2 billion people will be covered within the next year or two. The fundamental process is acquisition of the personal and biometric data, followed by “deduplication” – or weeding out duplicates. There have been questions about the registration process. Press reports indicate very rapid work, perhaps overly so, because the registering organizations are paid for productivity. People commenting on websites, however, report tedious waits and delays in getting registered – and uncertainly as to the benefits. Save taxpayers funds by removing “ghost” workers from welfare and job entitlement rolls. Provide a convenient single ID number that allows people to do banking and other transactions without need for further documents to prove identity or residence. Eventually substitute many other identity documents, or be incorporated into them. There’s also the issue of National Security. India has an issue with illegal immigrants mainly from Bangladesh – or it may have one, but since there’s no documentation, it can’t be verified. This is layered with fears that these immigrants, being Muslim, may provide cover for terrorists. (I’m not sure how this works; Bangladesh isn’t exactly terrorist central. And India has its own, completely legitimate, Muslim citizens – in fact, it’s one of the world’s largest Muslim populations.) However, the Aadhaar number is issued to every resident, whether or not they’re citizens or legally present in India. There’s a separate plan to create a National Population Register, which would include citizenship – but it’s not clear now whether these databases will run in parallel or be melded. Few of the benefits of the UID scheme work unless it is universal. Otherwise, it becomes just another documentation option, joining the PAN number and passport number and Driving license and ration card. For now, the government permits any agency to require its clients to give a UID number. It’s unclear right now whether this will mean that the field offices will have to keep biometric readers, or if they will be able to query a central database for a name/ number reference. Already, other uses are planned. One is to use it to track Tuberculosis patients, especially multiply-drug-resistant ones that move across districts, to co-ordinate their treatment. There’s talk of merging the tax authorities’ Permanent Account Number with the UID, and of using it to substitute voter registration cards. Anyway: Indians quite possibly will have unique ID documents within a few years. Meanwhile, there are opportunities inherent in the process, which will generate hundreds of thousands of jobs, and a market for special-purpose hardware. Companies can expect the UID to make a lot of commercial transactions easier. But there are still a number of concerns relating to the UID program. Commercial use. Though the government isn’t collecting the data for that purpose, it could become very attractive to companies – particularly if it’s cross-linked to, say, demographic or income information. Will the government be tempted, at some point in the future, to sell it? Hacking of the database. The more we depend on a centralized database, the more vulnerable we become to its being hacked or disabled – or its data stolen or misused. I have to admit I’m wondering about this. The fingerprints and iris-scans are reduced, after all, to bits and bytes. Let’s say I’m registered with the database. Could someone hack the computer and steal my number, associating it with a different set of biometrics? Presumably the “deduplication” would prevent this at the acquisition stage – but how often will the database be checked? Will it be deduplicated frequently? Mistakes and bad data. The scheme is being rolled out so rapidly that some bad data and fraudulent enrollments have already been caught. Can this process create a clean database? Glitches in the biometrics process. People fear glitches in the biometric process as the UIDs issued run into hundreds of thousands. Others point out that biometric data can be accessed without a person’s consent, using fingerprints left on glass surfaces, and iris-scans obtained through fraud. Even without fraud, problems could arise. Laborers, they point out, may have worn out fingerprints. What about people with damaged irises? The government says that by using 12 biometrics, and supplementing it with a different process for people with fingerprint/ iris-scan problems, it reduces errors to extremely manageable levels. It’s not just laborers. The other day, I went to have my finger-prints scanned. (In San Francisco – not for Aadhaar.) The machine tried, and gave up. I damped my finger-tips, dried my finger-tips, and tried different angles as the operator suggested. Nothing worked. And back when I used to visit Dubai frequently, I had a biometric card that should have allowed me rapid processing based on my fingerprints. Nope. The reader could never match my scanned prints with the ones on my card. Too much time at the keyboard, I suspect… my computer ate my finger-prints. This entry was posted in Doing Business in India, General, Regulations and tagged Aadhaar, population, Unique Identification Number. Bookmark the permalink. Rupa, when you say NPR is mandatory. What will happen if I am not registered at the Nat Pop Register. I wont get an MTNL landline or a Vespa Scooter, its fine. I have my Passport and other seven identifiers :-). Or I will not get a few subsidized gas cylinders for cooking. No one knows! 1.21 Billion Aadhaar cards, @Rs 100 approx to create data and create a card and courier (US embassy charges Rs 300 to courier a passport) would require Rs 121billion or 12100 crores. How much did the Parliament sanction. Ask Nandan, it was peanuts to begin with. Now Supreme Court has decided, Aadhaar can not be made mandatory. Gulliver is laughing at the scientists of Island of Laputa and their mysterious ways! So is Jonathan Swift.